We left Hot Springs this morning just as a bad storm hit, lots of rain and thunder but after a few miles the sun was shining and that lasted for most of our five-hour drive. It only started raining again when we were about 10 miles from Fort Worth and when we arrived here the sun was shining and it was lovely and hot with no sign of the predicted storms …. well, not yet anyway! You may ask what we do to while away the hours on a long drive. Well, today we completed some more of the license plate game, saw another three license plates so only have five more left to get. Also, we have Sirius XM satellite radio in the car and on there is a channel called E. Street Radio dedicated solely to our favourite boy, Bruce Springsteen. So, we spent most of the trip singing along to our favourite Brucie tunes. Travelling in the US is very easy, most of the highways being so straight and long and as we pass from one State to another there’s always a Visitor’s Centre full of maps and leaflets and people to tell you all about the best places to visit. Today, apart from visiting Dot and John’s, was the first time on our trip that we actually travelled on a road that we had driven before. 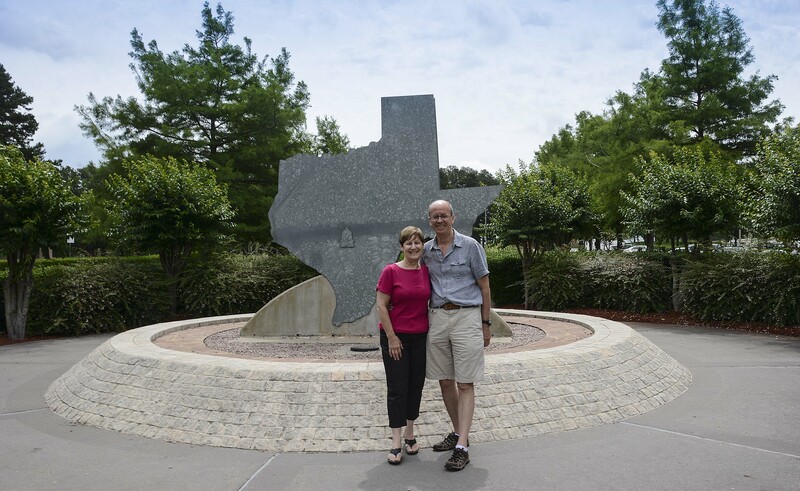 A couple of years ago we visited Dallas and passed by there today on our way to Fort Worth. We are at Fort Worth primarily to visit the Historic Stockyards and our hotel is bang, slap in the middle of them. People told us we would know we were here because of the smell (the cattle) but so far, no smell! The Stockyards were once the biggest and busiest cattle, horse, mule, hog and sheep marketing centre in the south-west, where more than 160 million head of livestock were sold and have operated under various owners since 1866. 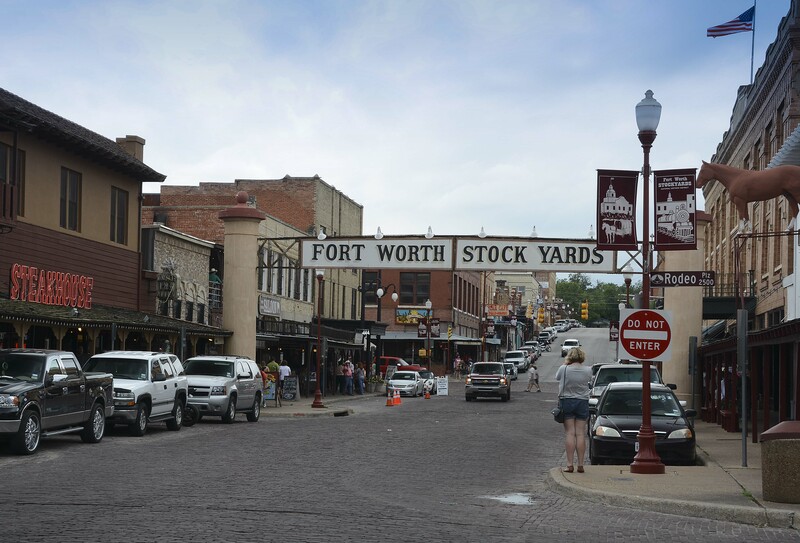 Today the 125 acre Stockyards National Historic District is home to restaurants, hotels, saloons, galleries, great shopping (if the brochure’s to be believed) and family-style entertainment. 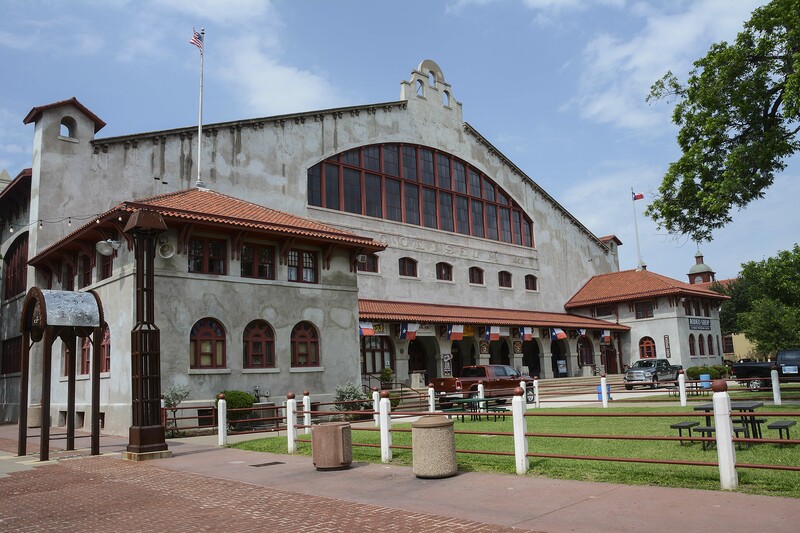 It was listed on the National Register of Historic Places as Fort Worth Stockyards Historic District in 1976. There’s lots to see here and one of the attractions is that twice daily a herd of Texas longhorn cattle are herded down the main street. It’s a sight to see. The cowboys driving the herd are all dressed in 19th Century clothes. (Pictures tomorrow). Tonight we go to the rodeo. What I didn’t realise was the rodeo is indoors so there will be no problem if it should rain. Yee haa!! Can you have a go on a bucking bronco? We could if we were brave enough!! Hi Pam, glad you’re enjoying the blog. Yes, we are having a great time. Doesn’t seem possible that we’ve been here nearly three weeks! 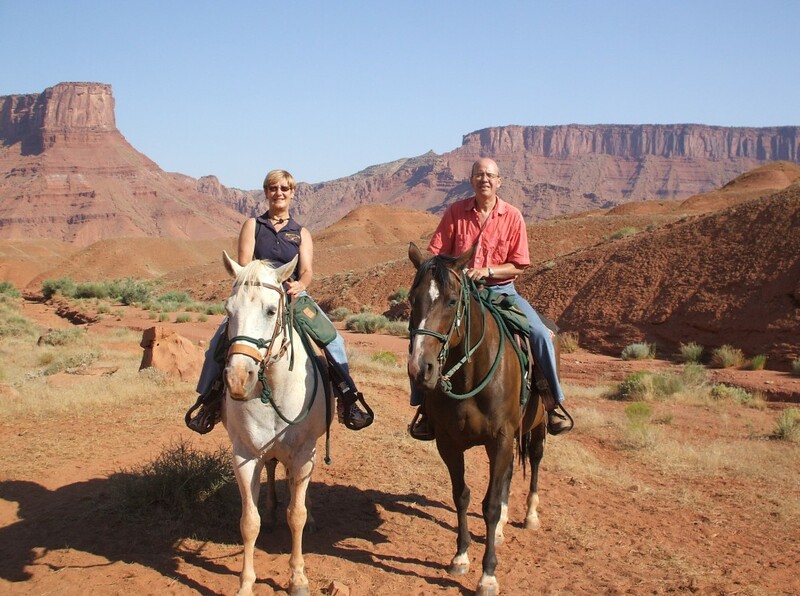 Okay Sandra, I have to ask…where are these poor cattle being driven? Not the butcher shop, I hope! No, not the butcher’s shop. They all have names and live in a coral in the Stockyards …. they seem very happy!